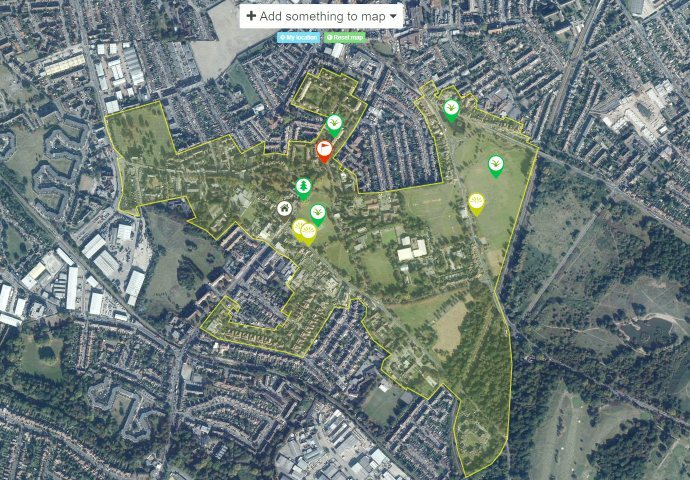 In late June we attended a consultation in Poulter Park about putting a wide cycle track along the stretch of the Wandle that runs along Poulter Park. The plan fits in with ideas about more work all along the Wandle Trail, and there’s been a big funding boost recently with £2 million granted from the Heritage Lottery Fund. There’s going to be a big launch of the Living Wandle Landscape Partnership that will administer this grant, and a celebration of the projects planned, at Morden Hall Park on 29th September. Information is at www.wandlevalleypark.co.uk. The consultation we attended was for a piece of work funded outside this larger grant, and was managed by Sustrans, who would be doing the work if it gets approved. A report of the consultation has been published, but sadly we find the report to be inadequate. We made a formal written representation, and while this is referred to in the consultation report, it has not been published in full. So we are publishing our comments here. We’re also publishing a drawing of the plans. This entry was posted in Cricket Green Conservation Area and tagged cycle tracks, Cycling, Wandle on September 12, 2013 by mitchamcricketgreen.